Team Zenyatta ended months of speculation when they announced the identity of the 2010 Horse of the Year's first mate: 2006 champion three-year-old colt Bernardini (TrueNicks,SRO). The cross of A.P. Indy (TrueNicks,SRO) and sons with Machiavellian line mares rates A++ on TrueNicks, with two grade I winners on the cross from only 10 starters. Jilbab, one of two grade I stakes winners on the cross, won the 2002 Coaching Club American Oaks (gr. I) at 12 furlongs. She is by A.P. Indy out of Headline, a Machiavellian half sister to speedy grade I-winning two-year-old Saratoga Six. In 2009, Flashing won the Test (gr. I) at seven furlongs and Gazelle (gr. I) at nine furlongs. Also a daughter of A.P. Indy, Flashing is out of the group III-winning Machiavellian mare Morning Pride, who extends from the powerful Square Angel/Nangela family. Immediate family members of Flashing include gr. I winners Fantastic Light, Gorgeous, Seaside Attraction, Golden Attraction, and Cape Town. Flashing's full brother Mandurah set a world record for a mile on turf, running 1:31.23 at Monmouth Park last June. Bernardini won the Preakness Stakes, Travers, and Jockey Club Gold Cup (all gr. I) en route to championship honors in 2006. He was second to Invasor (ARG) (TrueNicks,SRO) in that year's Breeders' Cup Classic (gr. I) at Churchill Downs. At the same event and racetrack four years later, Zenyatta would finish a gallant second to Blame (TrueNicks,SRO). Bernardini is off to an exciting start in his young stud career. His first crop are just three-year-olds of 2011, but he already has four graded stakes winners, plus grade I-placed Stay Thirsty. A Z Warrior (dam by Carson City) won last year's Frizette (gr. 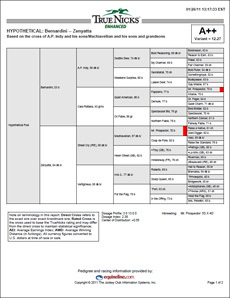 I) and is bred on similar lines as the Bernardini–Zenyatta mating, as both are extensions of A.P. Indy/Mr. Prospector. This successful cross is responsible for top sires Malibu Moon (TrueNicks,SRO), Mineshaft (TrueNicks,SRO), and Pulpit (TrueNicks,SRO). Bernardini's daughter Theyskens' Theory, a group III winner in England, and his son Stay Thirsty, second in the Hopeful Stakes (gr. I), both carry Roberto in the third generation. Zenyatta's foal will carry Roberto in the fourth generation, through her broodmare sire, Kris S.
Zenyatta is from the first crop of Street Cry (IRE) (TrueNicks,SRO). Given his youth, Street Cry has only seven starters as a broodmare sire to date, but two are winners, including Peruvian group III winner Gautier. Street Cry's sire Machiavellian has 59 stakes winners as a broodmare sire, including the above mentioned Flashing and Jilbab, Japanese champion Victoire Pisa, Breeders' Cup Turf (gr. I) winner Red Rocks, and European champion Shamardal (TrueNicks,SRO), who is out of a full sister to Street Cry. 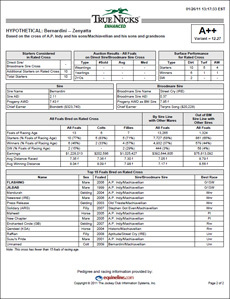 Click to view the TrueNicks Enhanced report for Bernardini–Zenyatta.